As Lisa Simpson once said, “I know all those words, but that sentence makes no sense.” She was speaking of an archive shot of a cinema marquee saying YAHOO SERIOUS FILM FESTIVAL. I am speaking, as always, of THE PHANTOM EMPIRE. Gene unwisely uses the approach to a deep gorge as his runway — young Frankie and Betsy leap from the moving vehicle and escape unscathed, but Gene pilots his aircraft straight down the crevasse. Cut to Queen Tkia clasping her bosom in alarm as she watches on her awkwardly placed circular floor-television. Could it be the stern-faced termagant monarch is sweet on the pudgy country singer? The television operator shoots her a cynical glance, but I don’t see what he has to be superior about: he has both spikes and bat wings on his helmet. When every fashion expert knows it’s one or the other, not both. Seconds later, however, the Queen is gesturing with satisfaction at the smouldering plane, and declaring “That is the end of Gene Autry.” She’s a deep one. The evil Professor Beetson and his hench-scientists find Gene, still alive, amid the wreckage, and realise from his Muranian garb that he can tell them where the entrance to Murania is hid. This is a fairly sophisticated use of dramatic irony: the scientists’ logic is that Gene’s tunic proves he has been in the underground city. But, as regular viewers and Shadowplayers, we all know Gene donned this disguise BEFORE he was abducted underground. And yet he really DOES know where the secret entrance is concealed. Wheels within wheels! Frankie and Betsy are transported by tube-elevator at three miles a minute down, down, remorselessly down to the thirty-third level of Murania. I can’t wait to see them presented to the Queen. I anticipate some kind of perfect story of bad acting, non-acting and un-acting, between three figures who have nothing to say to each other and nothing to achieve by meeting. Dramatic fireworks are sure to ignite. Every step of the journey to the Queen’s palace is lovingly documented, as always: the subterranean stables; the elevator, with its confusing dial; the shelf where the Thunder Guard stack their breathing helmets; the walkway past the model backdrop with the caped pedestrians and random robot. 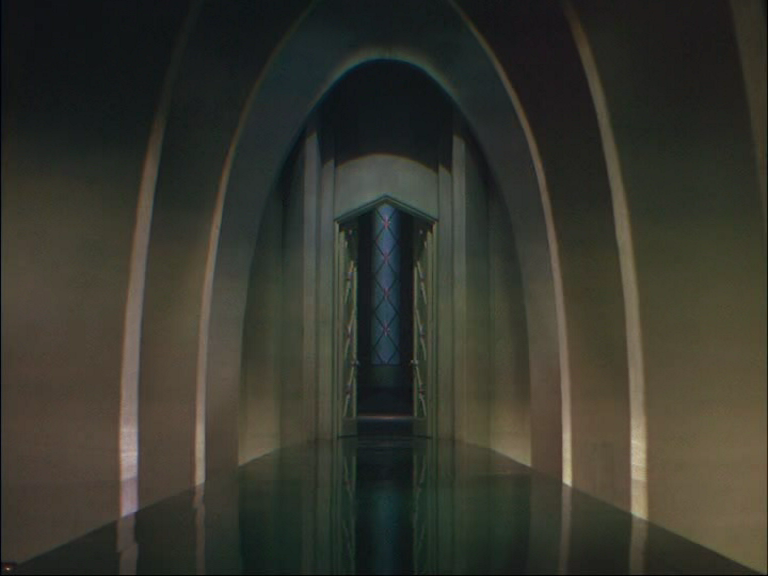 Though the palace seems to be without anterooms, the front door leading directly to the throne room so far as we can tell. Betsy King Ross is an illiterate. She compares the Queen to the “ugly Duchess” from Alice in Wonderland then quotes the Queen of Hearts’ “Off with their heads.” Inexcusable. When Tika condemns the “insolent offspring of savage surface men to a lifetime of confinement in the lower dungeon” I cheered. The unconscious Gene is being kept by Prof Beetson in the cavern, in the canyon, where he has been excavating for a radium mine. Gene’s inane comic sidekicks, whose tiresome scenes I don’t usually bother to mention, show up and effect a rescue, though Beetson himself is absent and so escapes having his skull fractured with a log. Rather than alerting the proper authorities, Gene joins the Junior Thunder Riders (a bunch of horseback kids with buckets on their heads) and rides off to bust into Murania on a vigilante basis. Fearing discovery, the Muranians remove the big “electric eye” from the rock face in which their garage door is embedded. The big chunky lens staring out of the scenery always did seem a bit of a giveaway. Gene arrives with his posse and is perplexed by the eye’s absence. Somebody asks him, “What’s an electric eye?” and he gives a detailed and wholly redundant explanation, leaning forward in his saddle and yelling carefully in the boy’s face: “When your reflection appears in it, the eye, by means of a photo-electric cell, operates whatever you want it to.” The effect is reminiscent of Gordon Cole in Twin Peaks. More technobabble underground: the Muranians set a deadly radium beam to guard the door switch — our young heroes miss that part of the exposition, and rush in to open the doors to the surface. A light starts flashing on and off and they stagger about, evidently victims of the deadly beam. Radium was a big talking point at the time: Marie Curie had just died. The factory girls poisoned by radium won their court case in the twenties but the story was still alive enough to form the background to NOTHING SACRED in 1937.